to play soundtracks of music and spoken word to accompany the imagery. as artists we are as holy musicians creating art that facilitates others to commune with the divine. This show is part of my process to mature and find my artistic heritage – to figure out who I am. 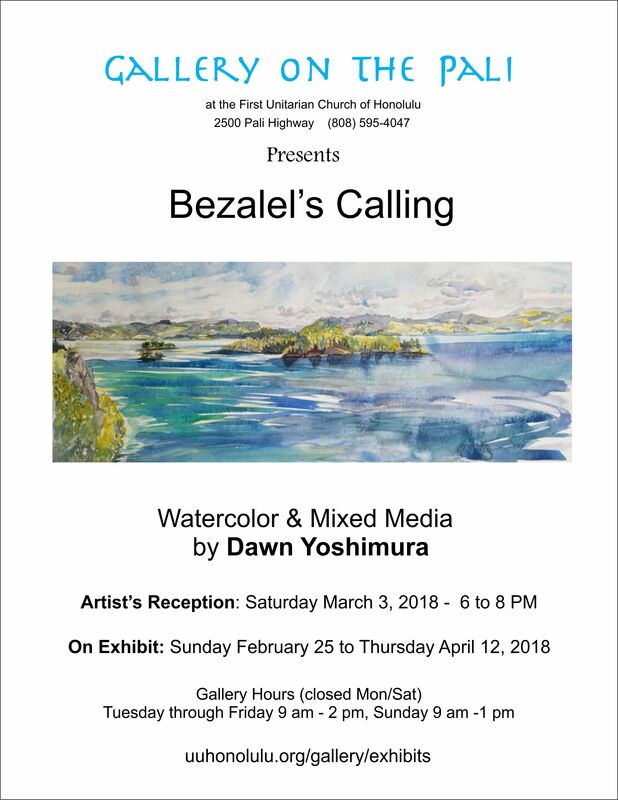 Bezalel’s Calling is a play on words for me—it’s the divine call to his true vocation as the first artist named in the Bible and I feel Bezalel is my artistic and creative ancestor and he is calling to me. Artists have been making art for tens of thousands of years—they have found cave paintings 50,000 years old! 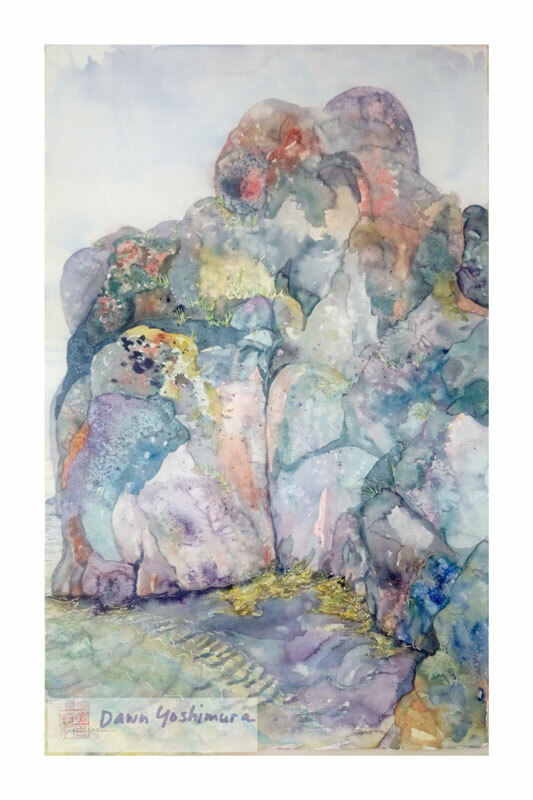 While at an artist’s retreat in 2015, I first read about Bezalel, a master artist who lived and worked on this earth long ago. Some cave paintings, 30,000 years old were done with a masterful observation of nature and human behavior. They found one cave where the artist used a blue pigment found 250 kilometers (over 155 miles) away! 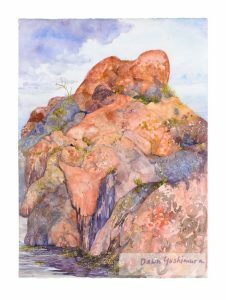 The more I paint and create—the more my senses are combining—becoming more acute. In 2016 we traveled to Iceland on a road trip driving around the island nation. The sense of scale and time was astounding—geological time made me feel very tiny—it was weird to experience a landscape as a Lilliputian. In the summer of 2017 (our most recent road trip) I was painting the landscape (“Scandanavian Sonata”) at the Norwegian-Swedish border and I experienced for the first time synesthesia—where I heard the colors I saw. It was a mystical awesome experience. 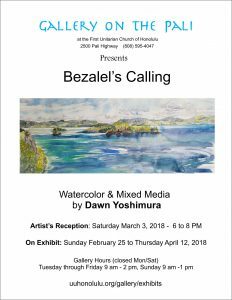 For this show, I asked my lifelong friend, Lori Yoshinaga, who also grew up in Kane’ohe like me, to look at the paintings I created and compose and record some original music to the pieces in response to what she saw in the paintings. It is not the same sound, obviously that I heard, but I would be curious to hear what others have to say when they see and hear the music accompanying the piece—does it fit? Do they hear something else? Does it trigger other senses or memories for them? As an artist, I am always puzzling out questions and solving some problem while trying to communicate my feelings about the question or answer. What did Bezalel use as his inspiration to build the first tabernacle? How did he figure out the right color dye for the pomegranates? How do I convey the emotion I felt seeing Sameland? Is it the same as Anders, my husband feels, as a part Sami (indigenous Swedish people)? I don’t know if this struggle to find my identity and tribe stems from the recent Hawaiian renaissance, but Hawaii as a whole seems to be asking a similar question — I have 0% blood quantum but I feel like a Hawaiian in the sense that I feel very much a keiki o ka aina (child of the land) since I was born and raised on Oahu. 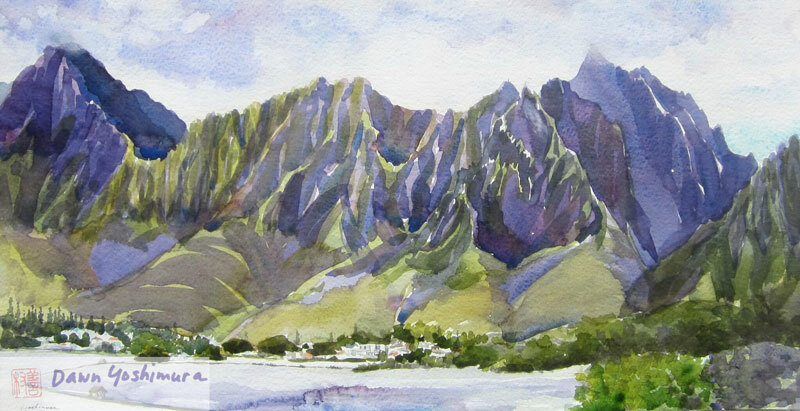 Kane’ohe in particular, is my home and kuleana. In today’s global world, we have both the identity society labels us with and the inner life to which we feel connected. 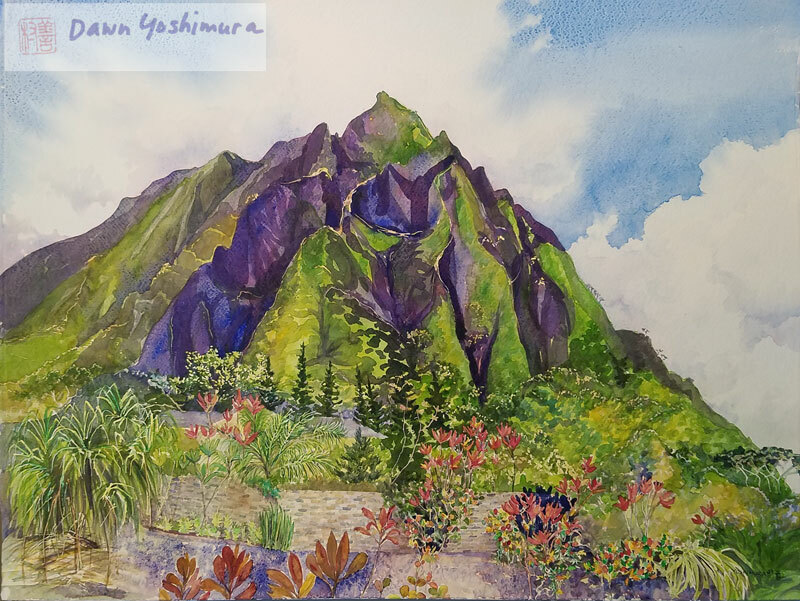 What part of a landscape that I paint is Japanese, Hawaiian, American, Swedish, female, Christian, etc? Do any of these identities really define my work when my connection is directly to nature and transcends these labels?